We created a warm and inviting dining room vignette in our studio as one example of how to incorporate a touch of Canadiana into your home while maintaining a style that is chic and sophisticated. We decided to take-on a couple of projects in the process. The lighting was key to this look. To start, we found beautiful antler chandeliers and sconces at Universal Lamp. We had them disassembled and chromed at Mayfair Plating. Once reassembled and rewired the transformation was complete. We were thrilled by the results. The chromed antler chandelier and sconces are true statement pieces. Click here for Universal Lamp and Mayfair Plating contact information. Our second project was inspired by a décor trend that’s been catching on – flag chairs. We decided to use the provincial flags of British Columbia and New Brunswick to represent the west and east coast at the heads of our dining table. Our design expert Michelle Mawby found these chairs on Craigslist for $25 each. 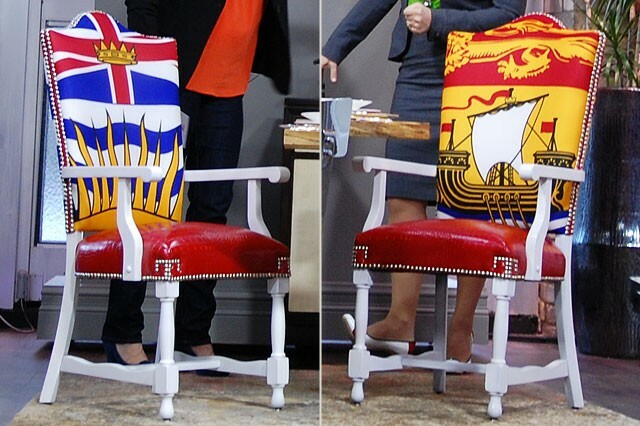 The provincial flags from the Original Flag Store and were upholstered by Lance Custom Upholstery. Michelle paired the flags with a bright red faux croc fabric and added nailheads to give the chairs a fresh new take on a current trend. Click here for The Original Flag Store and Lance Custom Upholstery contact information.